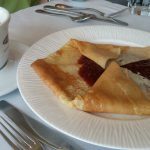 Once in awhile, I get a craving for crêpes – French-style thin pancakes filled with all manner of good things, both sweet and savory. Crêpes are really just envelopes to hold something delicious. As with tacos, there’s a lot more discussion about the filling than the shell. You’ll find, though, that there’s a good deal of variety in the crêpes as well as the fillings. Crêpes span the full range of the meal – appetizer, entree, and dessert. They can be made with white or buckwheat flour. 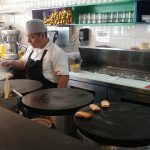 Professionally made on a commercial crêpe iron, crêpes can be as much as eighteen inches across. The ones I make at home are much smaller – the diameter of my non-stick frying pan. Fortunately, crêpe cravings are easily satisfied. 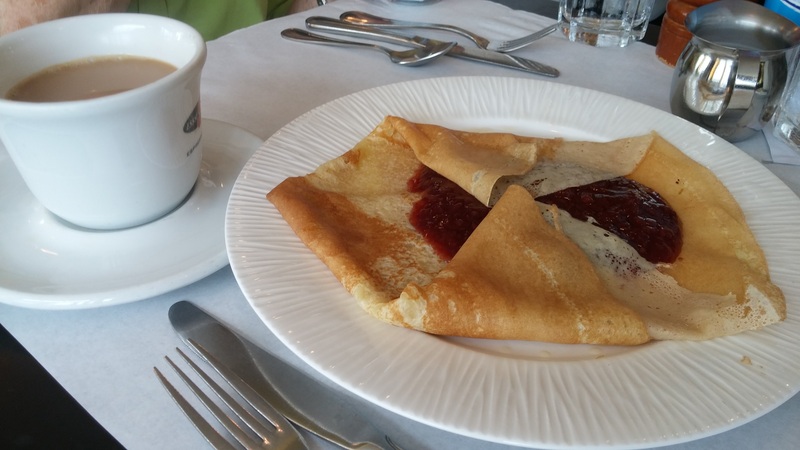 Cafe Dolce, on Main Ave. in Norwalk, offers a range of breakfast, savory, and sweet crêpes. 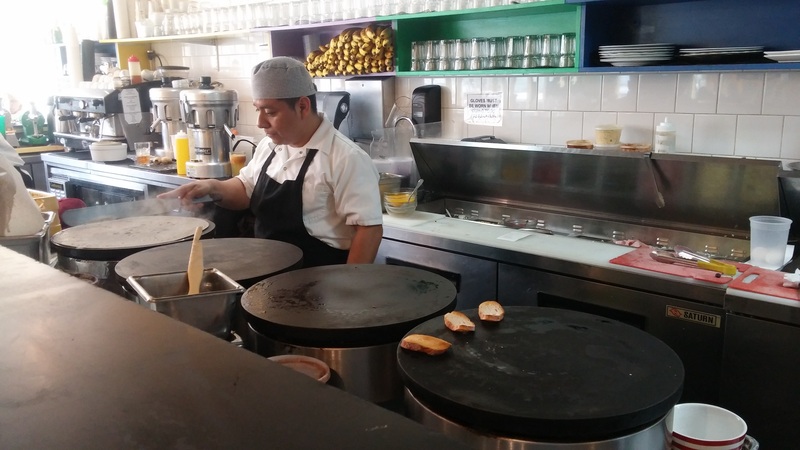 The crêpe iron is right behind the counter, so you can watch the crêpe-making process. I particularly enjoy watching the chef spread the batter in a circular pattern around the iron with a special tool. When the crêpe is finished, there are a number of ways it can be folded; square, rolled up, or in a triangle are the most common. An experienced chef can make this tricky bit seem easy. A properly done crêpe comes out golden brown with a gooey, melted filling. Ham and cheese is the classic combo for crêpe filling. Dolce offers a rich ham, mushroom, and Gouda combo rolled into a log as well as prosciutto and goat cheese with spinach and honey folded into a triangle. I recommend either one. Nutella, the velvety Italian hazelnut-cocoa spread, is a frequent partner in dessert crêpes. Cafe Dolce matches it with apricot, strawberry, walnuts, and farmer cheese. As delicious as that sounds, there’s some pretty stiff competition from Dolce’s sophisticated cakes and cookies. 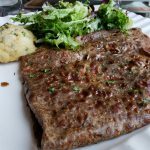 Lots of cultures around the world have a crêpe in their cuisine, but the French are the masters. 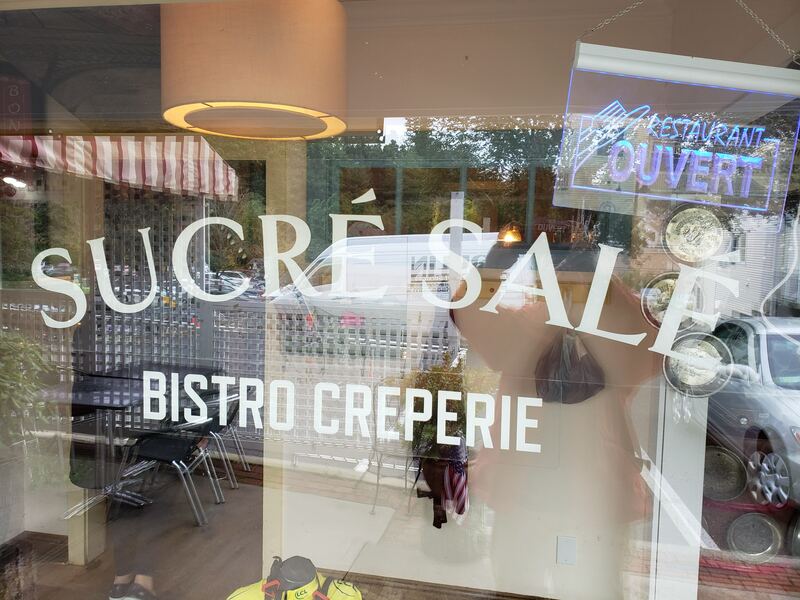 Sucré Salé in Ridgefield bills itself as a Bistro Crêperie. The atmosphere is genuinely French and the staff speaks with the accent to back it up. Even the TV in the bar is tuned to a French channel. There are eight savory selections, offered with either white or buckwheat flour. 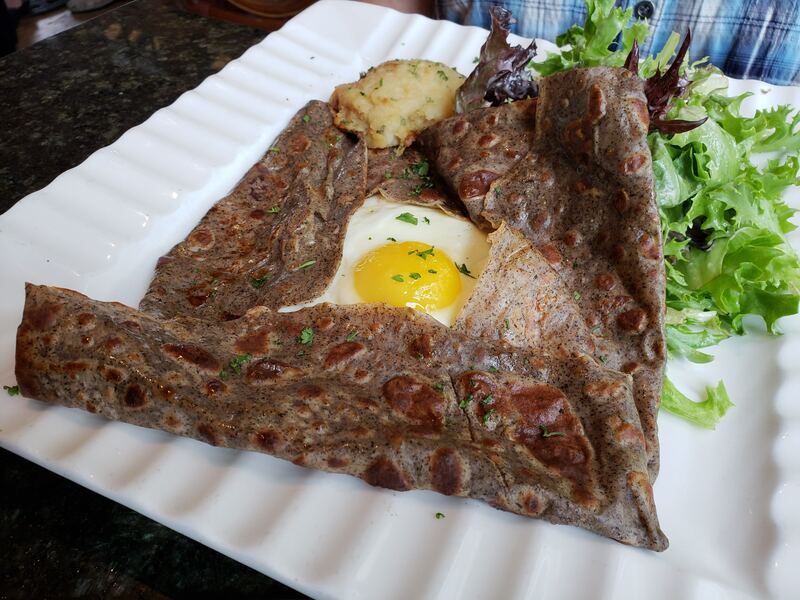 Among our favorites is a Galette – ham and Swiss with a sunny side egg peeking out of the center. The Dijonnaise has chicken sausage, mustard cream sauce, and melted brie folded into a tight package. 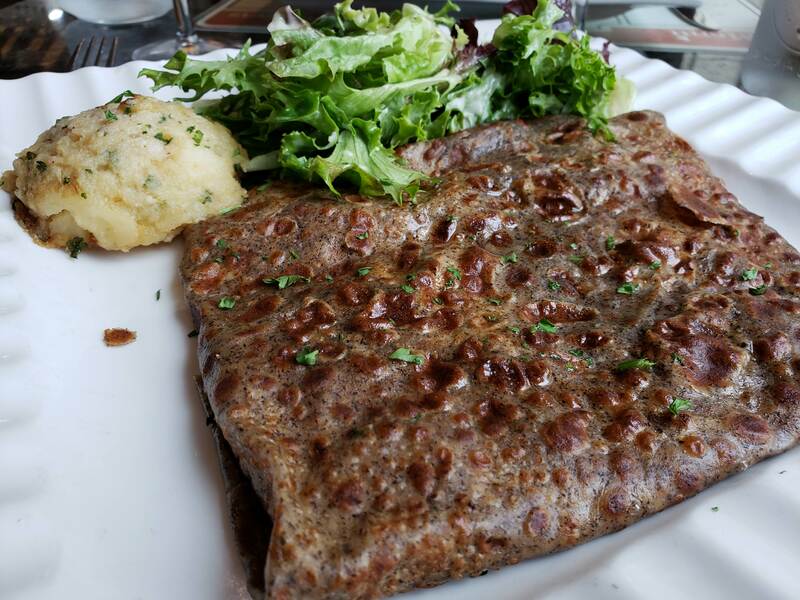 Sucré Salé crêpes come with a scoop of well-seasoned duchesse potatoes and a lightly dressed green salad. 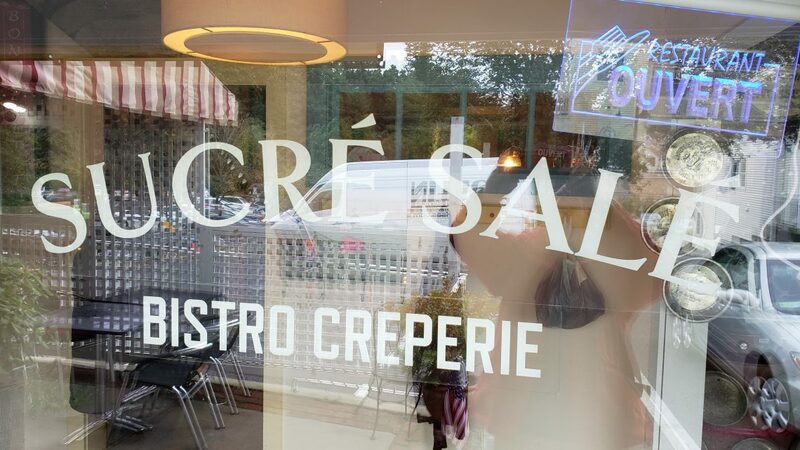 Additional tempting crêpes on the Sucré Salé menu include seafood, smoked salmon, spinach with mushroom, and duck confit. You can satisfy your sweet tooth with dessert crêpes including the classic – just a sprinkle of sugar and whipped cream. Other options include Nutella filled, banana-caramel, apple, strawberry, ice cream, peanut-chocolate, and Grand Marnier flambée. 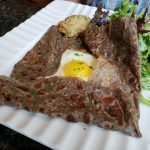 Buckwheat, the traditional ingredient for French crêpes, is not wheat at all. Its nutty flavor and dark color is associated with traditional crêpes. Not a grain, it’s naturally gluten free. When crêpe batter is made with 100% buckwheat, and it can be, then it’s GF. Further afield Méli-Mélo crêperie and juice bar on Greenwich Avenue is another destination for authentic French crêpes. 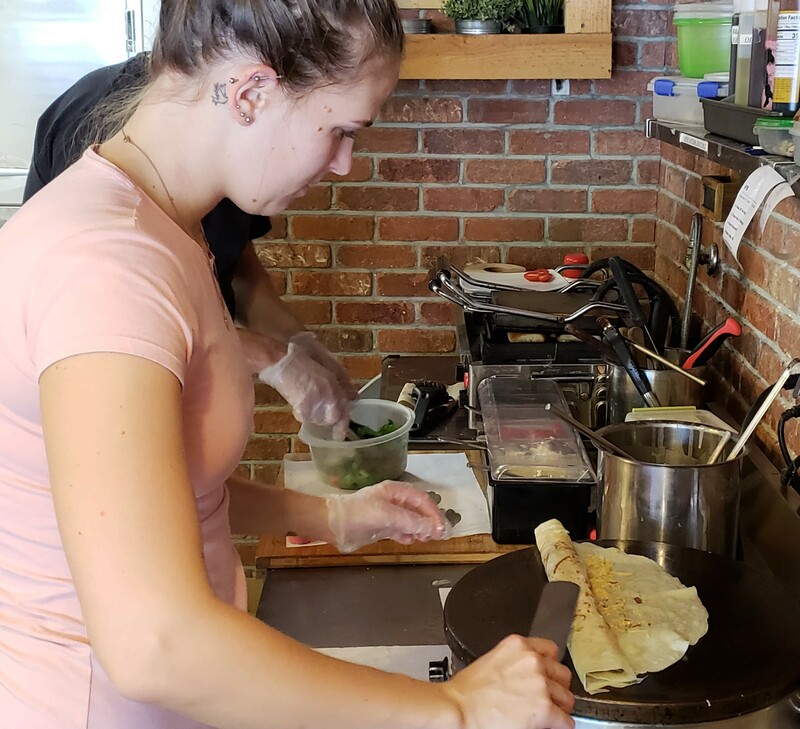 There are 24 savory buckwheat crêpes, 24 sweet wheat crêpes, and 6 crêpes flambées. All that choice is worth the drive. Crêpe cravings are easily satisfied at home too. Sweet crêpes, in particular, are crowd pleasers and a fun group activity. Line up some fillings and a few sauces and let everyone fill their own as they come hot out of the pan. 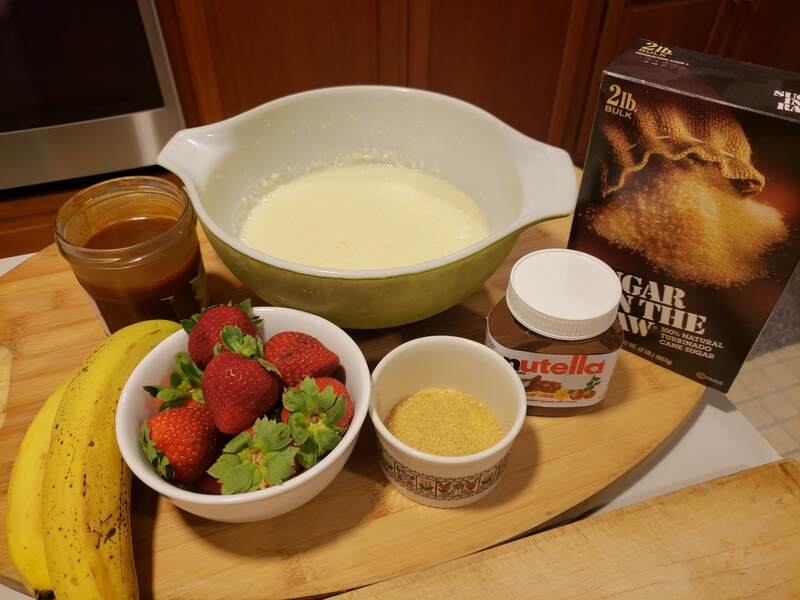 Sliced bananas, diced strawberries, a bowl of sugar, some good jam, caramel or fudge sauce, and of course, a jar of the dureguier Nutella are all you need for a memorable party. I like dessert crêpes made with white flour. Adding a little sugar and a drop of vanilla makes them more desserty. 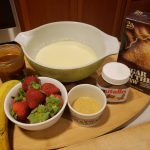 Crêpes are easy to make – flour, eggs, and milk are the basics. Some recipes suggest mixing in a blender, but I hate to clean the blender jar. A good thrashing with a whisk does the job just fine. Cooking crêpes in a non-stick pan is easy. I usually have to throw one or two away before I get the temperature right. You want them to brown some, but not too much. A quarter cup of batter in an eight inch pan works well. Pour in the batter and swirl it around for an even coating. Once the crêpe sets and starts to brown, it’s a snap to flip over. My craving for crêpes is slaked for now, but I’m sure it will return. As the cold weather approaches, what could be more enjoyable than a rich, satisfying crêpe hot off the iron?